David Buckman author of From Bow To Biennale: Artists of the East London Group recalls the forgotten name of Elwin Hawthorne, a prominent talent in the Group and an integral part of the lost history of one of the major artistic movements to come out of the East End in the last century. 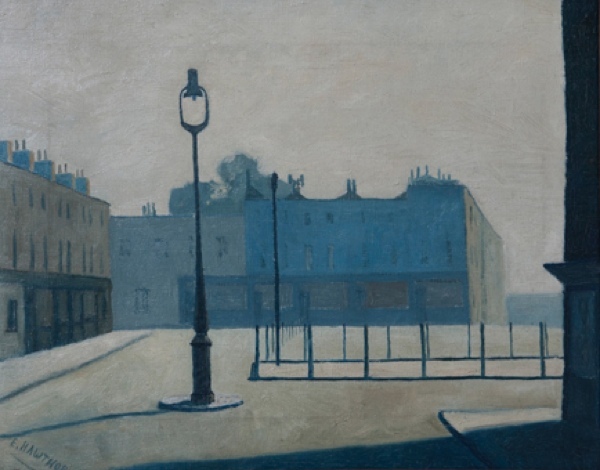 In November 2008, when Sotheby’s auctioned pictures assembled by Sir David and Lady Scott, there was keen bidding for oils by Elwin Hawthorne. Sir David acquired a taste for the artist’s work in the early nineteen thirties when Hawthorne was a star exhibitor at Alex Reid & Lefevre’s galleries of work by the emerging East London Group. Yet by the time of that Sotheby’s sale, Hawthorne was a forgotten name to all but a tiny group of enthusiasts who, like Scott, had been seduced by his melancholy, rather surreal views of London suburbs. The artist died in 1954, unremarked apart from family and friends, when he ought have been in his prime as a creative artist. Instead, disheartened by the lack of opportunities to exhibit, he had lost heart in his work. 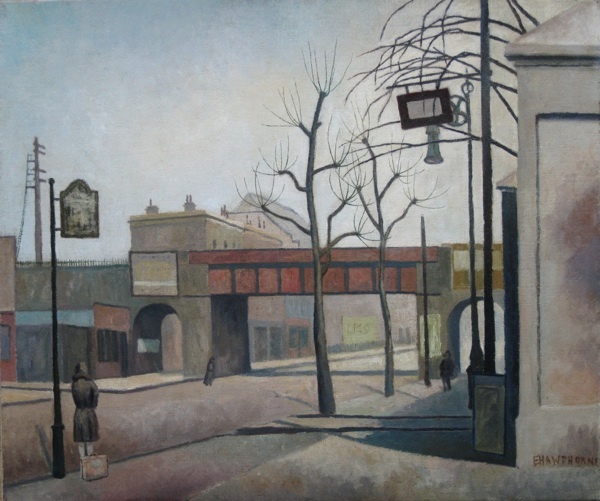 While researching my book From Bow to Biennale: Artists of the East London Group, I was lucky to meet Elwin Hawthorne’s widow, Lilian, then living in Vicarage Lane, East Ham. She had also exhibited with the Group, and provided invaluable memories of the triumphs and disappointments of her late husband’s career. Finally, when Lilian died in 1996, so unregarded was Elwin’s output that rescue work had to be carried out to save several pictures – two of these are among his paintings in my book. Elwin and Lilian moved into a newly-built block of flats in September 1953, only thirteen months before he died. 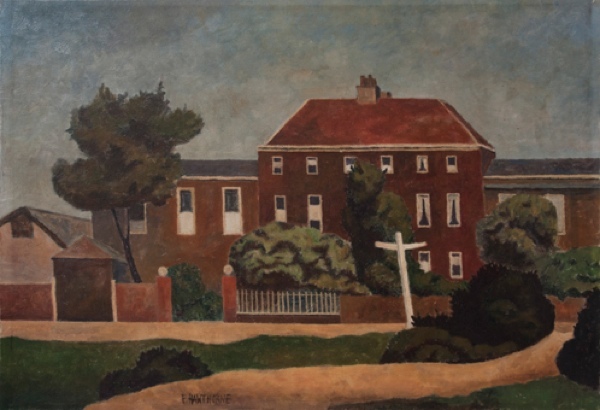 Since the coal bunker had no shelf, Elwin used one of his fine oil paintings on board “Trinity Almshouses, Mile End Rd,” shown at Lefevre in 1935. After Elwin died, Lilian rescued it, filling in two screw holes with wood filler and painting over the damage. A canvas entitled “Ilfracombe” was also discovered in the coal bunker, rolled up and flattened like an old rag under a pile of rubbish – this has recently been professionally de-creased and mounted on a panel. By the time of his death, Hawthorne had become a versatile artist, competent in oils, watercolour and printmaking, though his career as a painter in oils, his main achievement, was concentrated in just fifteen years, 1925-40. Born in the Bromley sub-district of Poplar in 1905, to a father who was house painter and decorator, his background was not auspicious for what he wanted to do. Elwin, his parents, five brothers and a sister and a basket-maker uncle, Henry Silk ( another member of the East London Group), lived hugger-mugger in a small, crowded two-storey building. When Elwin left elementary school at fourteen with no qualifications, he became an errand boy. 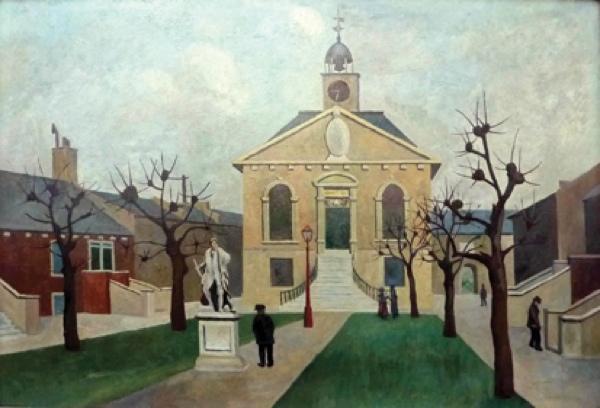 While unemployed he developed an interest in painting which led to classes at the Bethnal Green Men’s Institute and then the Bow & Bromley Evening Institute where the teacher was the inspirational John Cooper who was trained at the Slade School of Art. Although he originally showed under his correctly spelled surname of “Hawthorn,” when his work was chosen for the 1928 Whitechapel Art Gallery East London Art Club exhibition, the forerunner of the East London Group Lefevre series at in the West End in the nineteen thirties, he was catalogued as “Hawthorne” and urged to retain that spelling. He became a prolific exhibitor at Lefevre Galleries’ annual exhibitions and elsewhere, and attracted widespread press attention. When the first East London Group show was held late in 1929, R R Tatlock, writing in the Daily Telegraph, devoted three paragraphs of a large review to Hawthorne, praising the subdued palette that would become an abiding characteristic of his work. 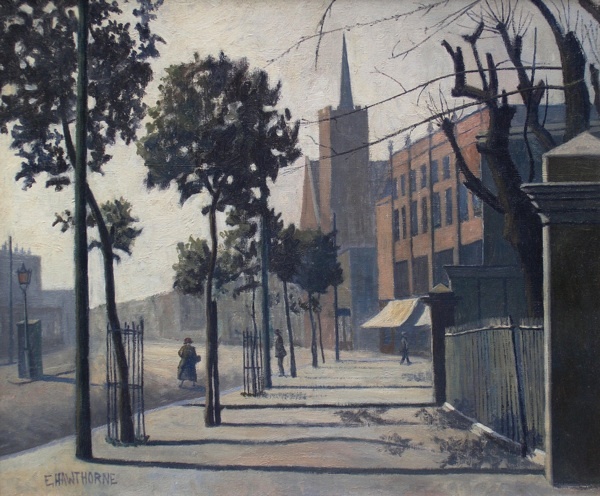 At the second Lefevre exhibition in 1930, The Times judged Hawthorne, “the most original artist of the group, producing pictures of East London which are the English equivalents – though more matter of fact – of what Utrillo is doing for Paris.” In fact, Hawthorne was compared to Utrillo several times . 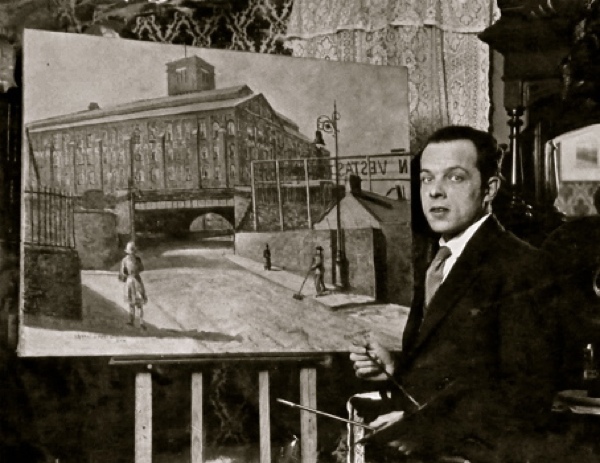 In 1930, Lefevre signed a contract with Hawthorne to pay him a modest salary of eight pounds monthly in return for a first-refusal option on his work, with financial adjustments to be made as pictures sold. At this time. Elwin was about two years into a three-year period as assistant to Walter Sickert, who had lectured to Cooper’s Bow classes and exhibited with the East London Group for a short period. Sickert had taken an interest in Hawthorne, who supported the veteran artist on several important works. Notable collectors of Elwin’s work were abundant. In 1938, as well as Sir David Scott and his Foreign Office colleague Montague Shearman, Hawthorne was able to list among his buyers the “Contemporary Art Society, Earl of Sandwich, Viscount D’Abernon, Earl of Radnor, Earl of Rutland, Sir Edward Marsh, Gerald Kelly RA, J B Priestley, Charles Laughton, James Agate and numerous others.” Today, eight public collections in Britain hold Hawthorne paintings. 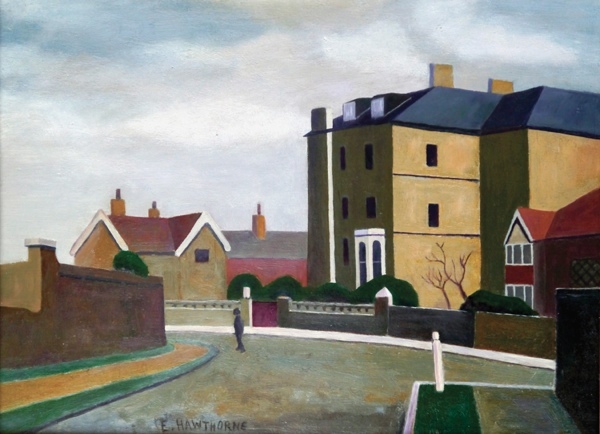 After signed the contract with Hawthorne which would continue for most of the nineteen thirties, Lefevre realised they had a star whose pictures were not restricted to the annual East London Group exhibitions. He was included in mixed shows both in Britain and overseas, and was given two Lefevre solo exhibitions. By this time, Hawthorne’s figure painting was developing yet even in one of his early works from 1929 – the picture of the Bryant & May Match Factory which proved a favoured subject for East London Group artists – the handling of the figures is assured. 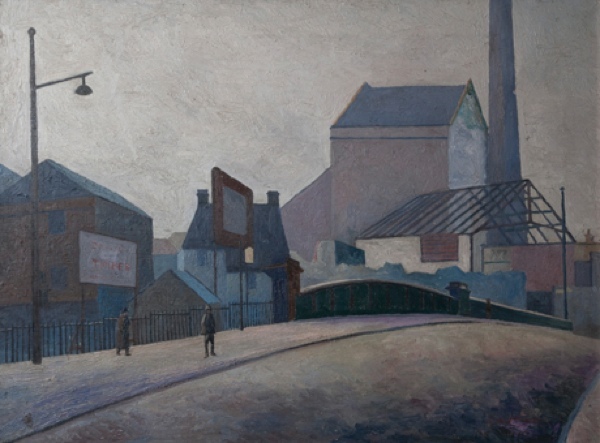 For his fellow East London Group member Cecil Osborne, the absence of figures in Hawthorne’s work, gave them “a ‘Sunday Morning look” with the sparsely populated streets contributing to their surreal quality. John Cooper was keen that his students visited exhibitions and it is possible that Hawthorne may have viewed the controversial 1936 International Surrealist Exhibition at the New Burlington Galleries, although a surreal atmosphere had already permeated Hawthorne’s work years earlier. Hawthorne had other preoccupations in 1936. 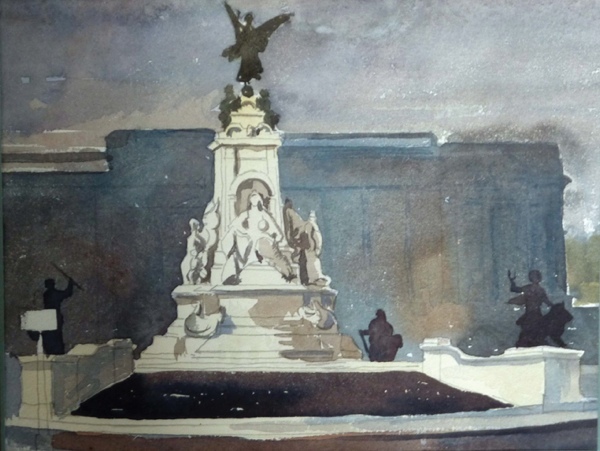 Along with Walter Steggles, he had a painting chosen for the British pavilion at the Venice Biennale, with a contribution entitled “Una Via Di Londra.” It was a great accomplishment for a former errand boy to have his work shown alongside professional artists such as Sir Alfred Gilbert, Duncan Grant, Dame Barbara Hepworth and Philip Wilson Steer. Also in 1936, The Artist included a lengthy, illustrated profile of him as the twelfth in its “Artists of Note” series, beginning by extending “our special gratitude” to John Cooper, since “it is the East London Group that has given us Elwin Hawthorne”. Although the final East London Group exhibition at Lefevre was in 1936, the gallery continued to promote individual artists’ works until World War II brought disarray to the art market. The hostilities effectively ended Hawthorne’s exhibiting career. After Army service, for which he was temperamentally unsuited, he returned to Lefevre, but they had nothing for him and suggested he take a job. He handled wages for radio and electronics firm Plessey, teaching art in schools part-time. Then, in 1954, he was taken ill on a bus to Woodberry Down School and died soon after in hospital. 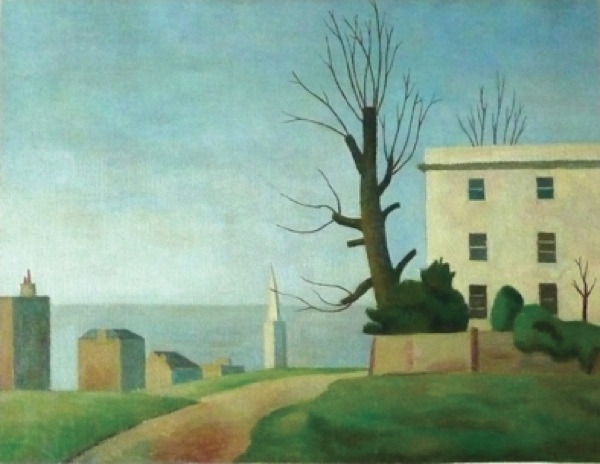 Elwin Hawthorne was only forty-nine, and he left a widow and two children – and he created a body of atmospheric paintings that survive to be acknowledged and appreciated now for their distinctive vision. Trinity Almshouses, Mile End Rd, 1935 (Private collection) - rescued from use as a shelf in a coal bunker. Ilfracombe, c.1931 (Private collection) – discovered rolled up in the coal bunker. From Bow to Biennale: Artists of the East London Group by David Buckman can be ordered direct from the publisher Francis Boutle and copies are on sale in bookshops including Brick Lane Bookshop, Broadway Books, Newham Bookshop, Stoke Newington Bookshop and London Review Bookshop. I love these pictures. Thanks for the article. These are wonderful, evocative paintings. How sad he was unrecognised during his lifetime – but how fortunate David Buckman has found him. Thank you. Thanks for this great article about my grandfather. I enjoy reading about him and love his paintings. These are wonderful pictures, I would so love to own one. Many thanks for the introduction to this lost group of artists. Wonderful to explore their work and stories. Astonishing pictures: coolly atmospheric and gently surreal, with a taut geometry and sophisticated colour sense. When will we have the delight of seeing them exhibited? Thank you David. A brilliant article about a brilliant and forgotten artist. Wonderful paintings and thank you for the opportunity to see them. So interesting to learn more about a family member. Elwin was my father’s first cousin, also a professional artist and from Mile End. I live in New Zealand and am thrilled to be able to see these paintings. Elwin was my mother’s first cousin though I dont think the family out here knew about him. It is great to have the information and I am passing it on to my relations. My father, Albert Hawthorn, was Elwins youngest brother. I met him several times and attended his funeral when I was ten years old. Obviously Jenny Higgins father and Mary Braddocks mother were also first cousins of my father. My mother, Ellen Payne, was Elwin’s only sister. She is still alive and is 93 years old!! Thank you for this very informative article. I love Elwin’s paintings and mum still talks about Elwin a lot, being her eldest brother. 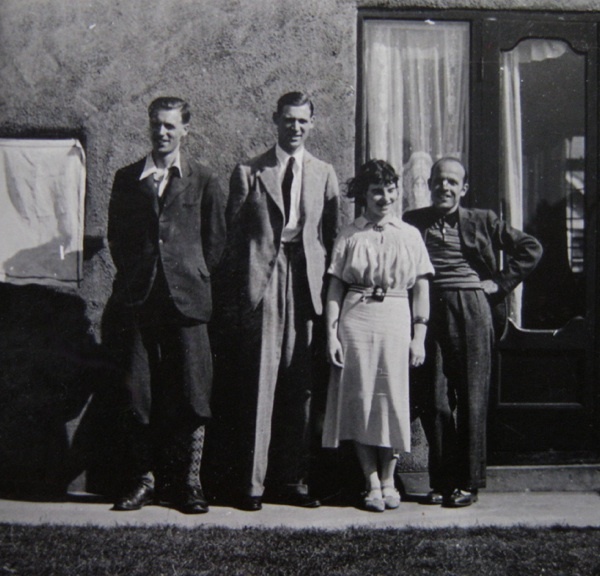 Was digging out some photographs and found some of Elwin, Henry Silk, who was mum’s uncle and who lived with her and also other members of the family. Fascinating to read. Have got the book “From Bow to Biennale” and am bowled over by it. 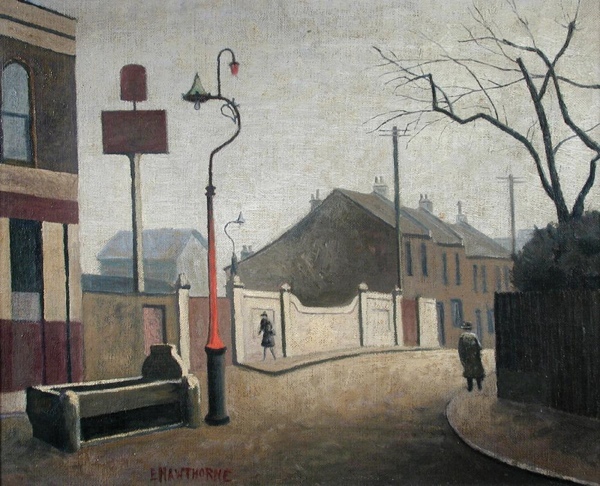 Lovely to read your article on Elwin Hawthorne.I was lucky enough to buy 2 of his works out of the Sotheby’s auction of the Scott Collection.Wonderfully evocative and as they now hang in our bedroom they help provide a charming start to our day. My mother, as a girl living in Burdett Street- Bromley Bow, used to work in Bryant and Mays and also Tate and Lyle’s sugar factory from time to time. However, her father used to find out where she was and make her go home to “help her mother”, which meant doing most of the chores. She was the youngest girl, with one older sister, four older brothers and one younger brother, but it was her duty as the youngest girl to practically wait on the others! Both sides of the family were English and originally from English counties, but I guess it was different around 1932-1936ish! Hello Paulette, I have seen your comment above and wondered what part of the family you are from? We might be related! After many years of family research I have discovered that Elwin was my husband’s 3rd cousin three times removed. We were delighted to discover Edwin and his evocative paintings. We had no idea there was another family member who was also an artist (Jenny Higgins’s post above.) It’s interesting that both my husband, and more so our son, have the love of art in them, our son continuing to draw and paint, his nearly two year old son also has started! What a shame that he was not widely recognized for the quality of his artwork during his lifetime!